Our location coordinate feature is an optional feature which can be enabled disabled on your application. 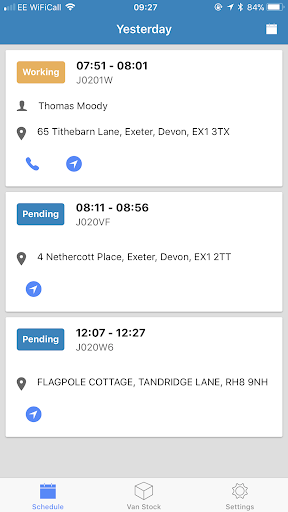 If you are interested in using coordinates, you can benefit from the map displays we have within the system to enable more accurate drive time calculation between appointments as it will use the coordinate data instead of the postcode. By enabling this feature, coordinates will be obtained from our Google Services API via the conversion of postal code or addressable location information into location geo-coordinates. Coordinates are securely stored as longitude and latitude fields within your application. 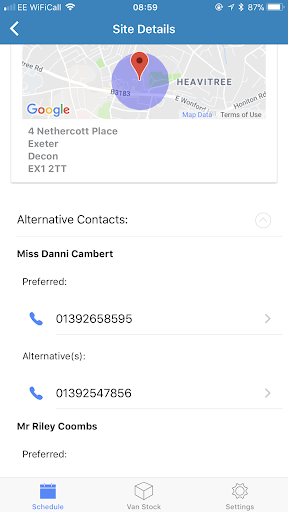 Coordinates will be used by the mobile application to enabled the driving directions button which can be accessed on the "Appointment" card for the list page and on the Appointment summary tab. By selecting this option it will launch the mapping application on the mobile device which could be Google Maps or Apple Maps. 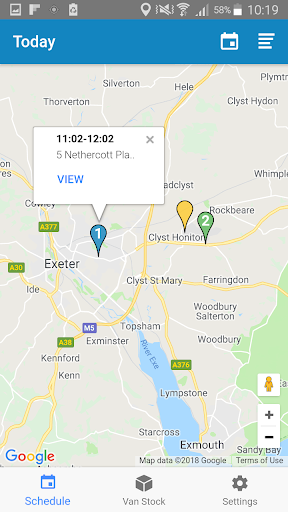 Under the Site Details page you will be able to view the site's location on a map - the user can zoom in and zoom out if they are having difficulties locating the property. If you're using coordinates, the mobile user will be a map view of their appointments. More information can be found under the Engineer Location and Map View section.